Now you can Ice Skate or Roller Skate anywhere any time with our portable synthetic Ice Skating Rink. 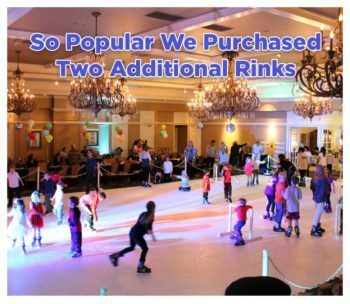 Our artificial Iceless Ice Skating Rink Rentals can be used indoors as well as outdoors. The Ice Skating Rinks are ideal winter wonderland attractions, but can also be use during the hot summer months. The popularity of our rinks has grown so much that we now have four rinks for rent. Level parking lots, tennis courts, or inside surface works best. 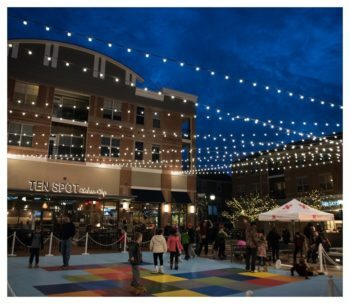 Setup includes rubber mats and stanchions around the perimeter, recorded music, decorative lighting for evening events and skates. Fantasy World delivers, setup and operates anywhere from New York to Florida and East of the Mississippi River.